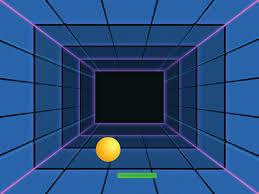 As part of this tutorial we will build one of the most classic video games of all time, Pong. If you have played the pong game on your video console, computer of the mobile phone you would know that there are many different versions out there. The version we are going to create is a simple one which consists of one bat at the bottom of the screen and a ball that’s constantly moving around. The objective of the game is for the player to use the bat and keep deflecting the ball making sure it does not touch the bottom of the screen. You will have the ability to customize the bat, the ball being used in the game, the background for the game, play music of your choice and any other customization that you think you want to put in. Clicking on the link opens up a new window. With the window now open you should see the tutorial as a column at the right hand side of the screen. Let’s change the musical tune and introduce additional music tunes during the game. Try cycling through 2-3 different musical tunes. Design a variable called Score and increment the score by 1 every time the user hits the ball. Decrease the score by 1 every time the user misses the ball and the ball hits the bottom of the screen. Set a timer to give the user a finite e.g. 60s, of time and let the user race against the clock. Try changing the background to suggest game over when the the game has come to an end. Speak with the other kids in class and ask them for ideas on what else we might implement to challenge ourselves.